Construct the perfect blunt with ease. This kit includes: 5 - EZ Splitz Cigar Splitters - Choose your favorite color: Red, Blue, Pink, Black or Clear. EZ Splitz are the new key chain accessory that is designed to assist the cigarillo smoker achieve the perfect cut every time. 1/2" Inner Diameter and 1" Long. Made of Hard Plastic Comes With Keychain. Warning Keep Fingers Out of EZ Splitz Openings. Ez Splitz assists you for a perfect cut, internal blade for safety. SURGEON GENERAL'S WARNING: Smoking Causes Lung Cancer, Heart Disease, Emphysema, and May Complicate Pregnancy. SURGEON GENERAL'S WARNING: Quitting Smoking Now Greatly Reduces Serious Risks to Your Health. SURGEON GENERAL'S WARNING: Smoking by Pregnant Women May Result in Fetal Injury, Premature Birth, and Low Birth Weight. SURGEON GENERAL'S WARNING: Cigarette Smoke Contains Carbon Monoxide. Construct The Perfect Blunt With Ease. Cuts Smooth And Straight Everytime. Achieve A Perfect Cut Every Time - Cut The Cigar Wrapper, Dump The Low Quality Tobacco & Insert Your Favorite Tobacco. 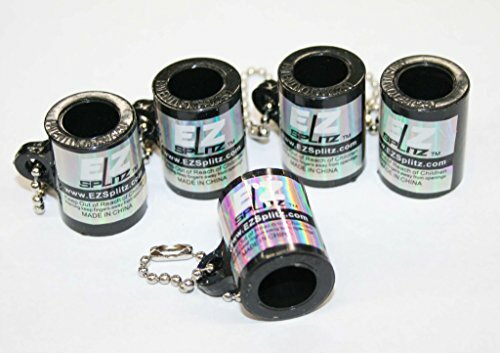 Pick Your Favorite Color EZ Splitz Cigar Splitter - Pink, Red, Black, Blue or Clear. Makes A Great Gift For Your Friends. Nice Size 5 Pack Allows Sharing With Your Peeps. Keep Your Splitter Close At Hand With The Handy Key Chain. If you have any questions about this product by SIR GARA, contact us by completing and submitting the form below. If you are looking for a specif part number, please include it with your message.